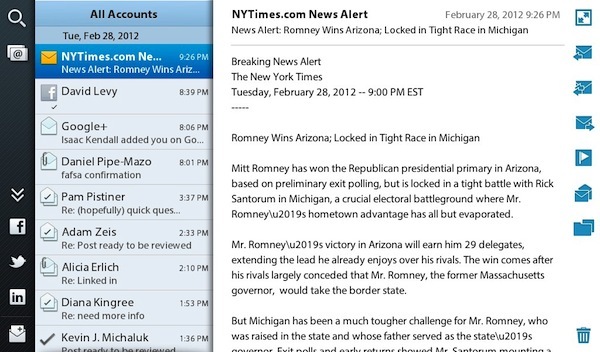 The Messaging app in PlayBook 2.0 is one of the most welcomed new features. 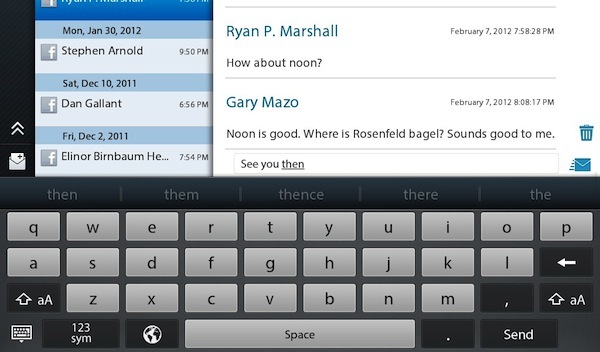 From one, central location, you can check, respond and compose messages. Both Email and Social Networking messages can now be handled in one app. When you see that blinking red light, a simple touch of the Messages icon will allow to you to see your new Email, Twitter Direct Messages, LinkedIn messages and Facebook messages. We will show you how to check your messages, read them, reply and start a new message for any one of your connected accounts right from the Messages app. Read on for all the answers to your Messaging questions! The first step to checking and responding to Email is knowing that you have email in the first place. 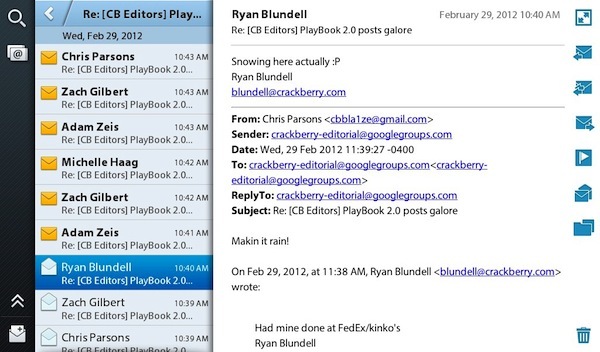 The PlayBook is, first and foremost, a BlackBerry; therefore, email notification is enabled from the get go. By default, your PlayBook will glow in the upper left hand corner of the screen when a message comes in, the LED will blink the familiar red blink and a short sound will be heard. This can all be user adjusted by pulling down the Menu screen, choosing Sounds and Notifications and then adjusting the settings. There is a volume slider for the Audio Notification and a drop down menu for the Visual Notification. 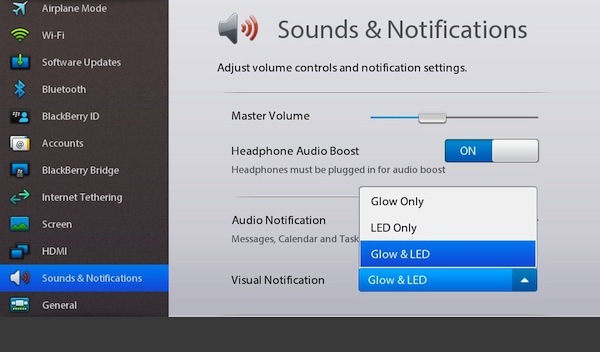 Your choices for Visual Notification are Glow Only, Led Only or Glow & LED. Tip: If you have notifications turned on, but you don't experience your PlayBook retrieving your messages, chances are that you have the Push setting turned to OFF in your Account settings screen. Just touch Accounts from the Settings menu, then touch the account in question and touch the Advanced Settings icon and on the next screen make sure that Push is set to ON. When you see the red light blink, or the screen start to glow in the top left corner or hear the notification sound or see the New Messages icon in the top left - you have new mail. If, after all that, you still don't know you have email, well, I'm not sure the PlayBook can notify you in any other ways! New messages will be shown in BOLD and the envelope will be Golden in color. Just touch the new message to read. If you want to see all the images in your email, just touch the Get Images button. For security, external images are not loaded by default. If you want images to load all the time - automatically, just pull down the Menu from inside the Messages app and turn on the Download Images by Default button. Along the right hand side of the Message is a vertical column of icons. The top three icons are used for replying to a message. Note: These icons are only present when reading an Email message; they won't be there for Social Networking messages. Touch the top of those three icons to Reply to the sender of the Email message. Touch the icon immediately below (with two arrows facing left) to Reply All. Always be careful when you Reply All and make sure you really want everyone to receive your response. The third icon, immediately below the Reply All icon is the Forward icon. Just touch Forward, and input the name of your contact to send on the email. 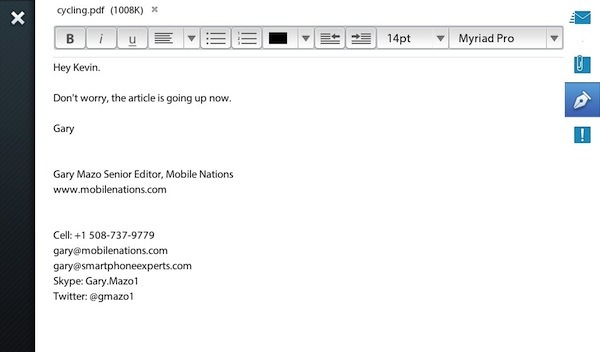 It is always a good idea to input some text above what is being forwarded to put the email in context for the reader. 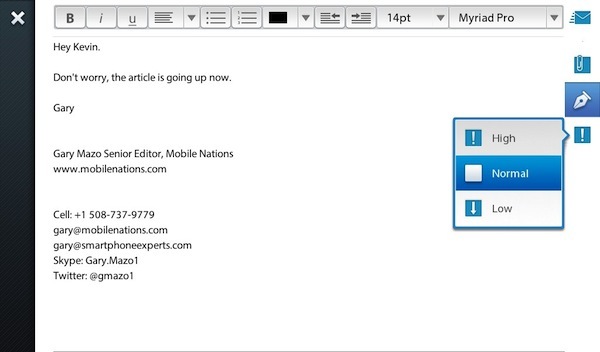 In the body of your message, type in your text using the new Rich Text Editor explained here. You can turn off the Rich text Editor by touching the icon along the right hand side that looks like a fountain pen. 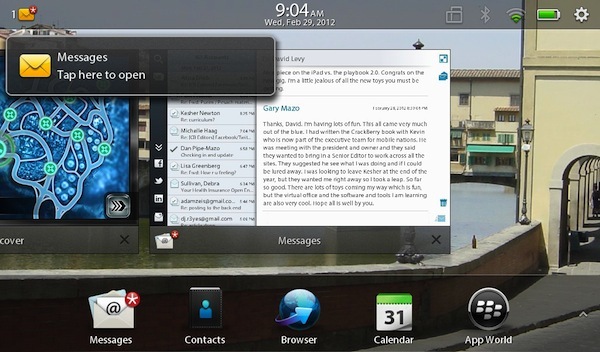 Once your message is ready, you can attach a file stored locally on your PlayBook by touching the Paper Clip icon. 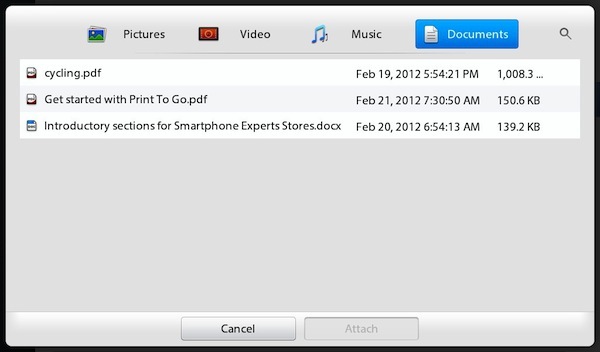 Once you touch the Paper Clip icon, you can then choose from Pictures, Videos, Music or Documents that are stored on your PlayBook. Select the attachment desired and then touch the Attach button. You will see the attachment now at the top of the screen. You can always touch the small "x" to cancel the attachment. 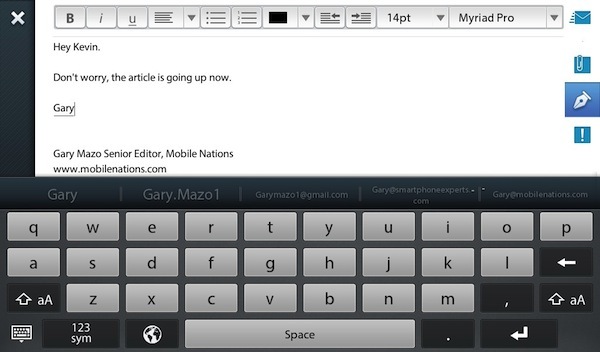 To set the Priority of the email, touch the Exclamation Point icon located right below the Rich Text Editor icon. You can choose to have your email be High, Normal or Low priority. High Priority will result in a red exclamation point in the subject line. 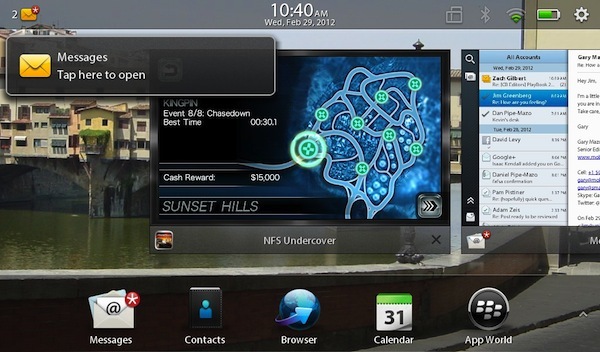 Pull down the Menu from the top of the screen to show other options available to you. You can Compose multiple windows (and have up to four windows open) by choosing the Compose Email icon. (We will cover this is a future PlayBook 101 lesson.) 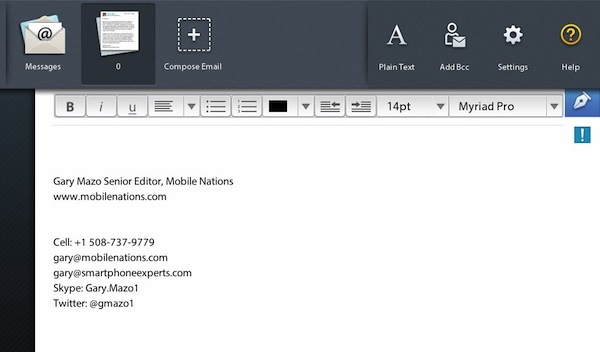 You can change the email to plain text by touching the Plain Text icon. This is useful is your recipient can't view rich text email and the message is more important than the medium. Touch the Add Bcc icon to add a blind carbon copy recipient to the message. Touch the Settings icon and the Settings menu will be displayed. 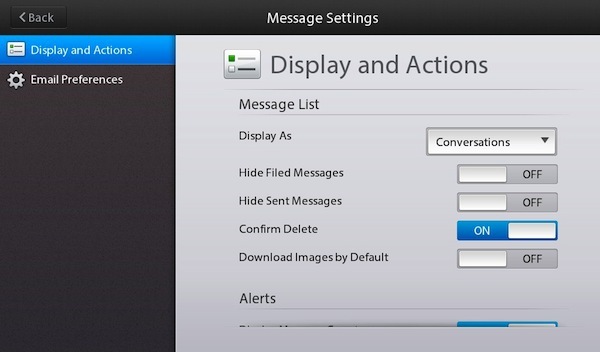 From this menu, you can change your Display As options from Single Messages to Conversations. You can also hide both filed and sent messages by simply turning ON the radio buttons. You can also turn ON or OFF buttons to Confirm Delete and Download Images by Default. The last buttons cover the Alert options discussed above. 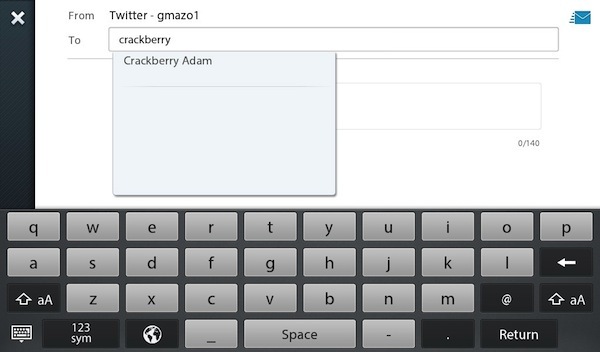 The unified inbox on the PlayBook offers users the ability to control, read, respond and compose messages in all associated accounts right from the Messages app. This means that when you get a Facebook, Twitter Direct Message or LinkeIn message, they will appear in your inbox. Messages will have the icon of the Social Network as opposed to the Envelope icon used in emails. 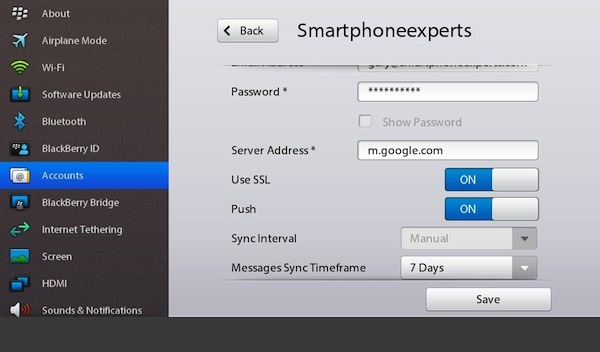 You can also touch the icon for each connected Social Network account by touching the "@" icon at the top left of the left hand vertical row of icons. Then choose the account you want to view. In this example, I am looking for a particular Facebook message, so I touch the Facebook account icon to see only those messages in my inbox. I can then just type in a quick message in the bottom window to respond. I can also choose to Compose a message in any of my Social Networking account by touching the appropriate icon along the bottom left of that same row of icons. The Composition screen appears and I can just enter the recipient in the "To" field. Since all my contacts were sucked in when I set up the accounts, they start to appear as I type the names. From there, I just type in a Subject and a message and hit the Send button in the top right. The only account that will limit your character count will be your Twitter account, since this will be a Direct Message with the 140-character limit. 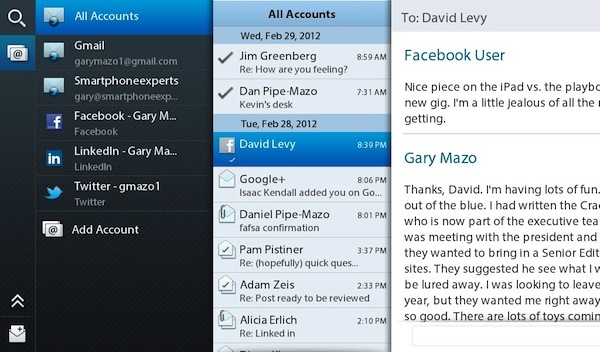 With the new unified inbox, checking and responding to messages is now very easy and very convenient on the PlayBook. There are many more email tips and tricks that we will cover in future posts, but to see how your fellow PlayBook users are faring, just hit up the BlackBerry PlayBook forums!